Purdue Computer Science's K-12 Outreach summer 2009 activities brought middle school students and teachers to the Lawson Computer Science Building. 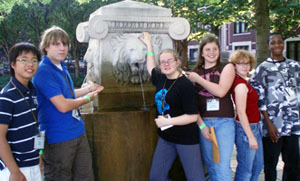 The central CS summer events are the annual CS summer camps. Participants from middle schools around Indiana and surrounding states engaged in computer science activities in the beginner and advanced editions. Teachers also got some lessons on incorporating computer science into their classrooms in the Linking Mathematics and Computer Science workshop. CS Beginner Camp took place June 14-17, and welcomed students in grades 6, 7, and 8. After checking into Hillenbrand Hall, students participated in ice breaker activities, joined their groups for a campus-wide scavenger hunt, and were introduced to Windows Movie Maker. The following day campers learned about programming in Alice, and had a great time at movie night. Students continued learning the fundamentals of computer science in the Lego Robotics sessions, toured the Envision Center, and cheered on their creations at the Lego Challenge. The camp was wrapped up with a lunch for campers and their parents. CS Advanced Camp ran June 17-20, and was available to students in 7th, 8th, and 9th grades. On their first day they also got to know each other with some ice breaker activities, and a group scavenger hunt around campus. They received a lesson on Windows Movie Maker that night, and got involved in some CS Unplugged activities. They delved more deeply into the Alice programming session than beginner campers with Alice Frenzy activities. After a fun night of bowling, participants got creative making artistic designs or interactive prompts using the Python programming languages. 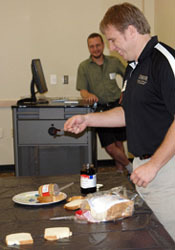 They also got to program using Pico Crickets, and enjoyed a showcase luncheon with their families. Middle school camps were funded by Caterpillar, Eli Lilly, and Raytheon. Students were not the only ones having fun in CS this summer. Teachers from Indiana and Ohio joined the Outreach crew for the Linking Mathematics and Computer Science workshop. Teachers learned how to incorporate computer science fundamentals into their mathematics lessons. They took home loads of CS Unplugged ideas, including a peanut butter and jelly programming activity. Teachers also received lessons on graphing calculators, VPython, cryptography, and careers available to computer science majors. The Linking workshop was funded by the Motorola Foundation. Members of the CS Corporate Partner Program provided generous give-aways for summer outreach activities.